Reduce the word gap experienced by poorer children when they start school. Ethnographic insight, desk research, academic literature review and consultation with expert advisory group to design a range of four interventions. Families across UK test the products in their homes for a short period of time and provide feedback. Listening to parents and improving prototypes. Larger quantities of products were tested amongst more families. 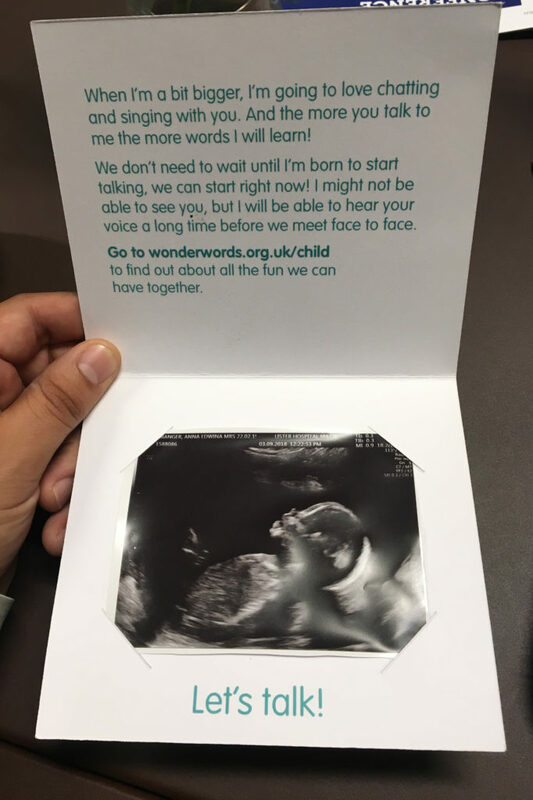 Will putting messages on pregnancy scan photo frames drive people to find out more about talking with their child? 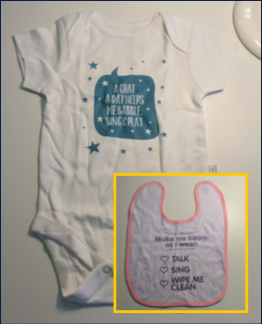 Will motivational messages on baby products such as bibs, changing mats and babygrows encourage parents to talk, sing and play more with their baby? 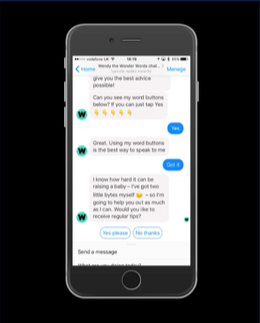 Can a friendly chatbot – Wendy – get parents talking and interacting more with children as they carry out their household chores? 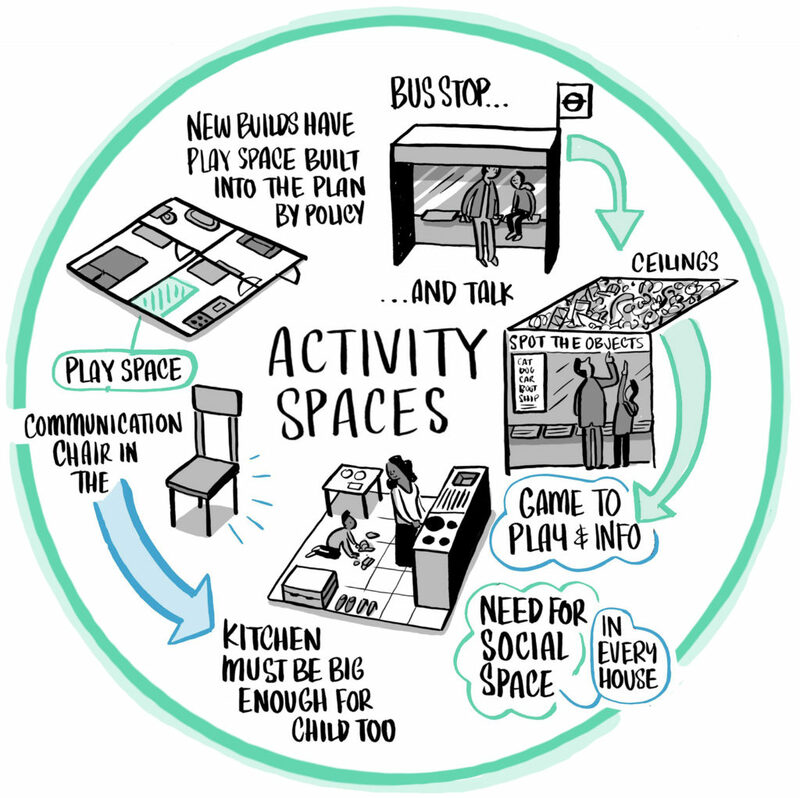 How does the home environment influence a child/parent interaction? Could the design sector be mobilised to pick up the challenge? Two out of four interventions showed positive signs of increasing the amount that parents talk, sing and play with their children. Demonstrated the power of motivational messaging applied to baby paraphernalia was (a) behaviourally impactful, and (b) popular with parents and the items had the potential to be viable consumer products. Proved chatbots are effective at engaging this audience, content deployed through chatbots can be behaviourally impactful, and worked out how to convert Facebook users into chatbot users. Forged new relationships with strategic partners, for example the Behavioural Insights Team and major players in the design sector. Helped Save the Children’s innovation team adopt a new, agile way of working. Attracted third-party backing for further Wonder Words development with a six-figure donation from Johnson & Johnson and a multi-year partnership with a high street retailer.